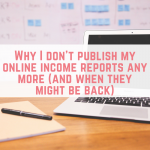 Here we are again at my favourite time of the month – income report time. March has been a really, really great month for a number of reasons. I have finally found an effective and efficient way to manage my time which has made a big difference to my productivity. It has meant that I have enjoyed more time away from working because I am working smarter and not harder. Of course I am still hustling away but I am not getting distracted as easily. Reading back over my previous income reports I noticed that I mentioned I had been feeling unwell a lot. In March I finally got a diagnosis but together with medication and a lifestyle haul I am starting to feel better. Adjusting to the medication has been hard (losing up to 4 hours a day to nausea isn't fun!) but I am getting there. March has also been a really fun month. I headed to London with Lisa to taste Easter Eggs with Quidco which is pretty much living the dream and I also reorganised my office which has helped with the productivity. I love the new arrangement a lot! It may have taken forever but I've done it! The rest of the office has a massive pile for eBay and then another pile for the car boot sale ? but at least my corner is clean and decluttered (yes I have a notebook problem….). Massive thanks to @coldserenity for moving my furniture for me ? I won't keep you waiting any longer – let's get stuck in! If you would like to see any of my previous income reports then you click here to see them all. I was expecting a lot from matched betting in March thanks to Cheltenham Festival. The festival saw me earn £550 over just 4 days so afterwards I was wary of taking up too many offers from bookies in case they saw me as milking them for offers. I took things a lot slower but I am still thrilled with money I earned. This is money I have earned from my own matched betting accounts – my husband does matched bet but we don't include his matched betting earnings in our income reports. My matched betting earnings now stand at over £9,000 since July 2015 – completely tax free and risk free. And yet another happy matched better! It really is great to see others hitting their earning targets with matched betting. If you are still on the fence about matched betting then why not consider giving matched betting a free trial? 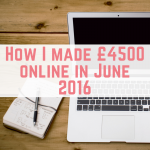 You can make anything from £40 – £60 and see if it is for you – you have nothing to lose. 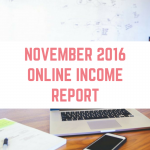 Remember that month 3 also overlaps into October – from now on I will be reporting the matched betting income per calendar month. 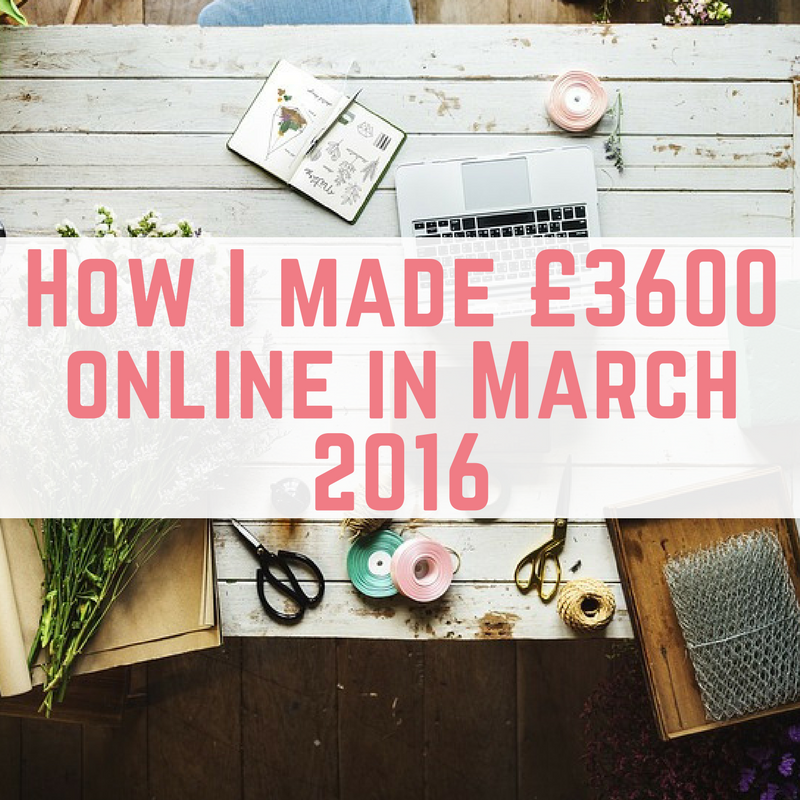 I am thrilled to see my affiliate earnings have increased by just under £200 in March! 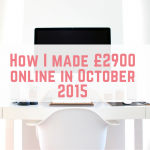 In October the amount I earned from affiliates was just £581.59, so to see it grow before my eyes is wonderful. 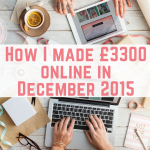 I have doubled my affiliate income in 6 months and I wonder if it can be replicated over the next 6 months! In March I published my guide to getting started with affiliate marketing which is a great resource for monetising your blog and it has been well received. It covers three big affiliate programs including Affiliate Window, Amazon Associates and Skimlinks. If you are interested in making your own website so that you can start making an affiliate income then I have a great video guide to get you started. I have been working hard to bring in two more affiliate programs and in April I should start to see some earnings coming in from these. Between us we currently have six websites, all earning us an income from various sources. These earnings are for non-affiliate earnings – so sponsored posts and advertising (through Google's Adsense). I am really pleased to see this number up from February's income report. I made an effort to grow my traffic which helped with the Adsense earnings, and I took on some higher paid sponsored posts. I am also increasing my sponsored post fees from April as a trial. In March I also purchased another domain name in an attempt to diversify our income. Relying heavily on one income source doesn't sit too well with me, so we are both working hard on our other websites to see them grow. The plan here is to keep growing traffic and looking at extra revenue streams for the existing websites. My survey income seems to remain solidly around the £40 mark. Now that I am making a decent amount of money from matched betting and affiliate earnings, I don't really want to sit completing online surveys for a few pence. However, I really enjoy the surveys on Prolific Academic and MintVine, so I keep doing those whilst watching tv and I have also started completing more surveys for OnePoll. I view surveys as a way to unwind and get away from anything too heavy for a few minutes and the income is now just an added bonus. With my affiliate earnings growing, I didn't feel the need to pursue much other work throughout February. I kept up with my existing freelance clients but I didn't seek out any extra work or take on any new clients. March has been another expensive month with domain and hosting renewal with GoDaddy, travelling to London for the Quidco Easter Egg event and other related costs. Staffing costs. That's right, I have my first member of staff. It is a very small, commission based role. Here are some of the top posts from March 2016 – a combination of new posts and older posts that are continuing to perform well. I found myself texting my friend the other day and saying “I can't believe this is my life now” and it is really true. I am incredibly fortunate to be in this position. Of course there are always going to be people who can only see the negative in what I do, whether it be to sell my smelly shoes on eBay or promote matched betting. However this is my life and I am living it how I choose to live it. I am incredibly pleased with how things are going but I am always self evaluating and hoping to improve. I do truly make money, save money and live the life I want! 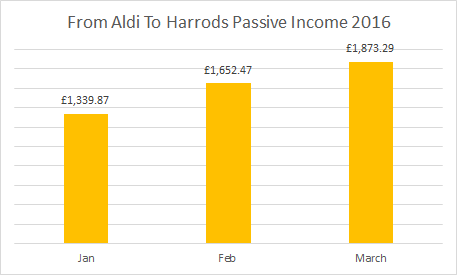 In March my passive income was a massive £1,873.29, an increase from February's £1,652.47. You really cannot wipe the smile off my face. That is money made whilst we were sleeping, at the cinema or out shopping. I am absolutely blown away by this amount and so grateful for it. The passive income comes from my book sales, affiliate marketing and my rental property. Taking the time to grow our passive income in the winter months means that I am really looking forward to having more time off in summer – time to go to the beach, go on day trips and just enjoy being outside. As a result of my passive income increasing I am going to start a whole section on passive income with weekly blog posts on the topic! I have so many exciting plans for the coming months and I can't wait to share them with you! One thing that I am making a priority is the Elite Blog Academy. 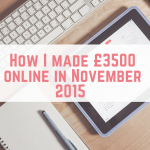 I believe that if I really want to be hitting £5,000 from online income by December then I really need to step up my game. After lots of research I believe that the Elite Blog Academy is the way forward. It wasn't cheap, costing $499 (around £350) but I decided to invest in myself and my business. One thing that I really struggle with is where to throw my attention and how to implement everything I want to…I get so overwhelmed by it all that I end up doing nothing. I am hoping that Elite Blog Academy is the tool that will refocus me and help me to reach my monthly targets. I am slowly working my way through the assignments, making changes and learning things as I go. I have roped in friends, family and even some of my lovely readers to help answer a few questions about the design of From Aldi To Harrods. From all the answers I have received, as well as three test videos from Peek (which I can strongly recommend! You can request three tests a month for free where someone will visit your website and answer some questions about the usability including what they like and what they don't like) I have decided on some design changes including a new StudioPress theme. These will all be implemented throughout April to help to bring a more streamlined experience to my readers. As a reminder, here are my financial goals for the rest of 2016. 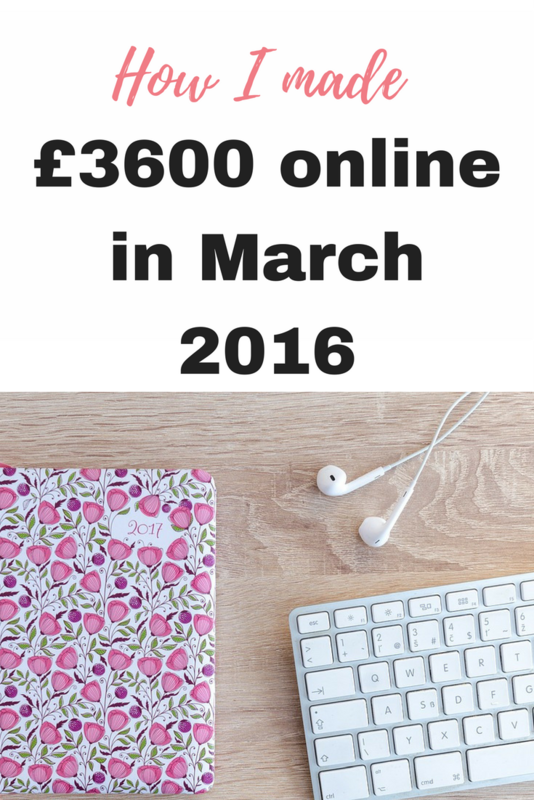 In April I need to increase my income goal by £250. Thanks Sarah, nor can I sometimes! Another amazing month for you, well done! Unfortunately, it was not the case for me 🙁 oh well, onwards and upwards! That’s such a huge amount of money to earn. I am yet to do affiliate marketing and learn about it but I’m unwell at the minute so maybe in a few months I’ll learn more about it. 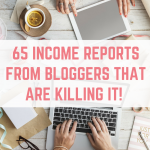 Great as always to read that you are doing so well, it really inspires me to keep going with my own ambitions for blogging and passive income. Working for someone else 9-5 is so outdated, and it’s so great to see you are proving that. Thank you! I agree that working for someone else is outdated – I want to work harder for myself, not to earn someone else money. Good luck with reaching your targets. Thanks Lynn! £18.50 is better than nothing – it was only recently that I was getting more than that from AW myself! Hi,love your blog, very interested in the match betting thing, how have you got 2 accounts, how did you get away with being at the same address? Hi Liam, there aren’t many bookies that are “partner friendly” so there aren’t many where we both have accounts. 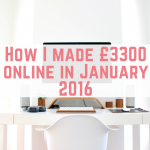 This is why we don’t include my husband’s “earnings” from matched betting – it is kept aside for holidays etc. Oh right,have asked to be in your FB group if that’s ok.
A great month no doubt – also, you have such a diverse income stream so well protected against the ups and downs of affiliate marketing. Good job! Thank you Ellie, I think it is so important to have multiple income streams (in fact it is an upcoming blog topic!). Good luck! Hard work will definitely pay off! I love your desk chair! Very jealous of that. You re doing so well, go you! It is awesome, isn’t it? The same chair is still on sale at Ikea but with different patterns. Thanks Claire, I’ve added you now. Let me know if you have any questions. I find you very inspiring- I want to lead a life I love… Your income reports are encouraging to show multiple incomes can lead to big things. Good on you! I have added myself to your closed group on facebook. Please accept “Kirsty Davies”. Thank you Kirsty, so kind of you to say! Hi Emma. Well done on another great month! Would like to join your MB group, please. I don’t have the funds to invest yet, but want to be in an environment of like-minded folks for inspiration for the future. You inspired me to start matched betting and I’ve made £200 in just under 2 weeks so thank you. 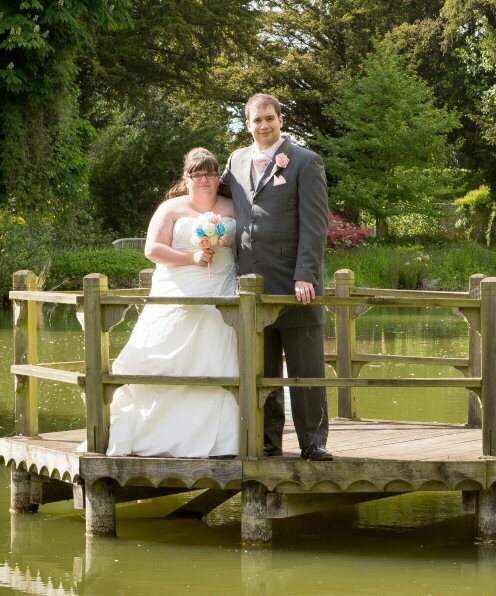 Please can you add me to the FB group – my name’s Leigh Faichney. Thanks.